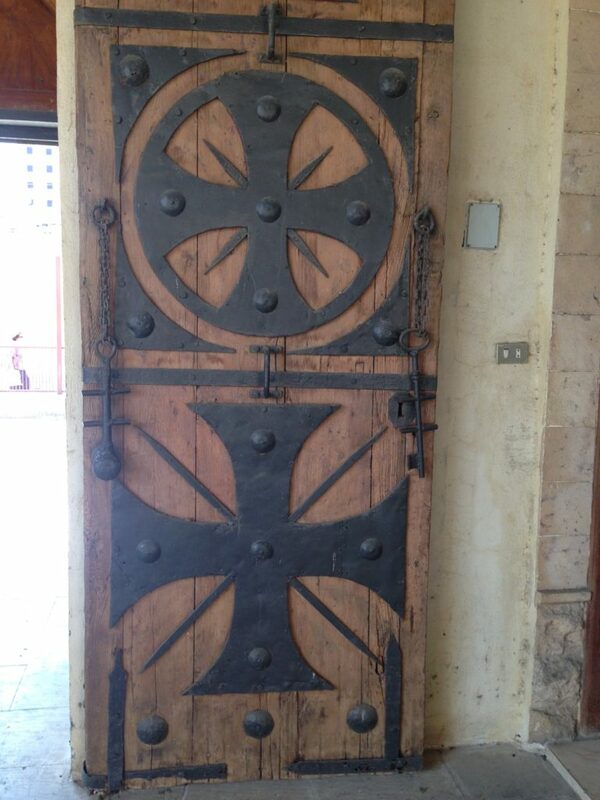 Coptic Cross, El Damshiria Church, Old Cairo. Approximately ten percent of Egypt’s population is Christian, the vast majority of whom are Coptic Orthodox. (According to Wikipedia, the Coptic Orthodox in Egypt number about twelve million souls, with the Greek Orthodox in second place at 300,000, and the Coptic Catholics in third at 200,000). Probably the best place to explore Christian Cairo is around the Mar Girgis (“St. 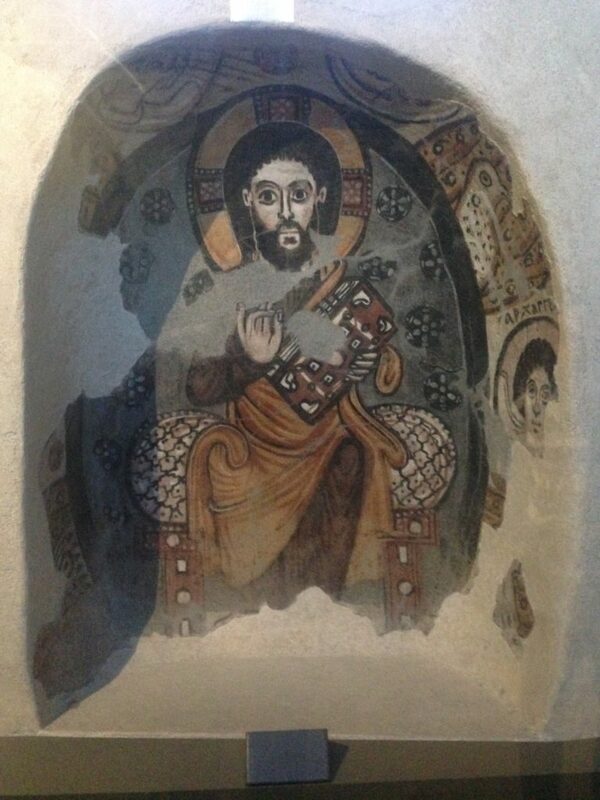 George”) metro station, where one can find numerous Christian monasteries, cemeteries, and churches. The largest and most obvious is actually Greek Orthodox, but the rest are Coptic, and quite historic. Exterior, Greek Orthodox Church of St. George, Old Cairo. 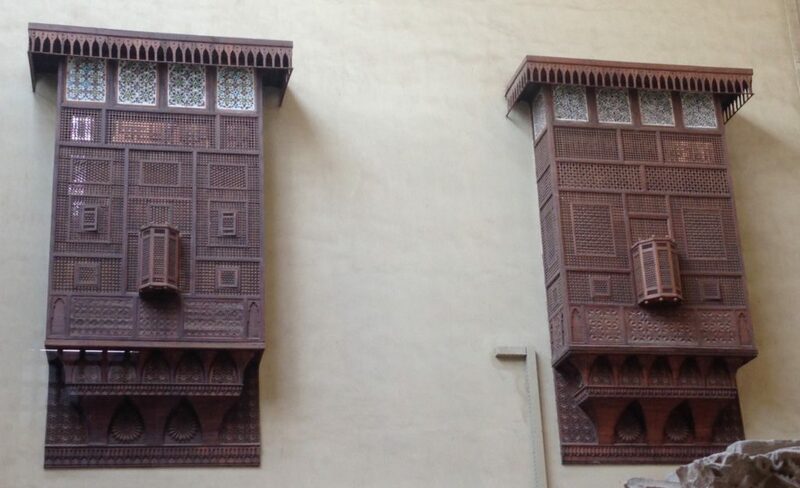 Pulpit and screen, Church of St. Barbara, Old Cairo. Nave, Saint Virgin Mary’s Coptic Orthodox Church (the “Hanging Church”), Old Cairo. Nave, St. Sergius and St. Bacchus Church (“Abu Serga”), Old Cairo. 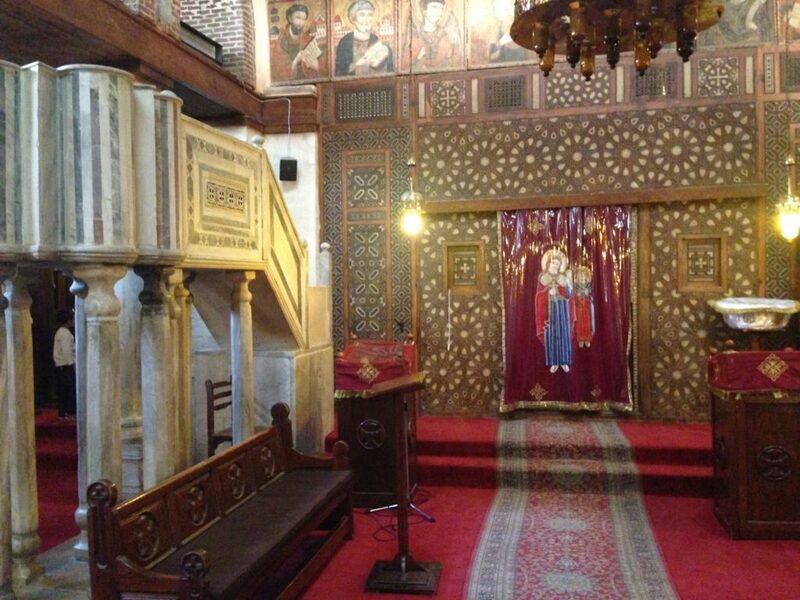 As you can see, in Coptic churches the sanctuary is closed off from the nave by a screen, which in these three cases consists of intricately carved and inlaid woodwork. Other features include a marble pulpit on the left side of the nave, pillars (often different in style from each other, representing the different apostles, according to my guide), and a wooden ceiling representing Noah’s Ark. 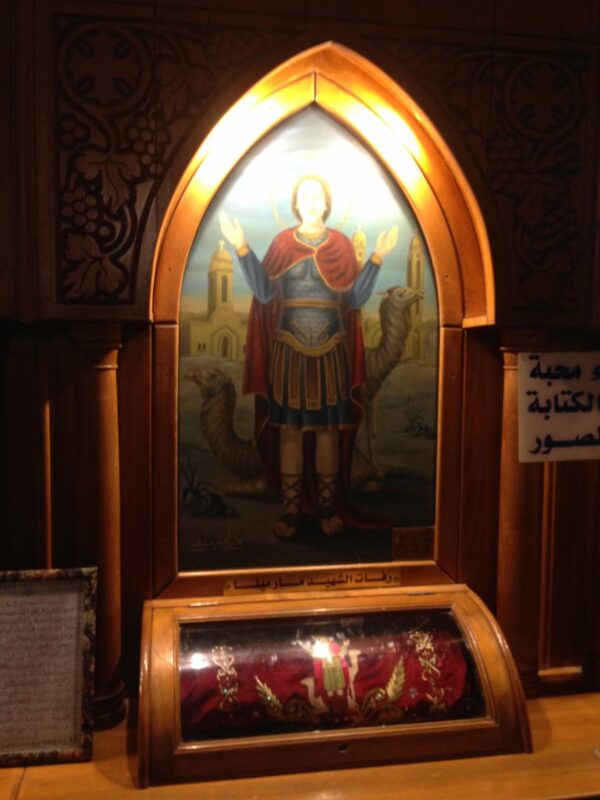 Abu Serga Church takes great pride in its status as place of refuge for Joseph, Mary, and the infant Jesus from the persecution of Herod the Great in Judaea. 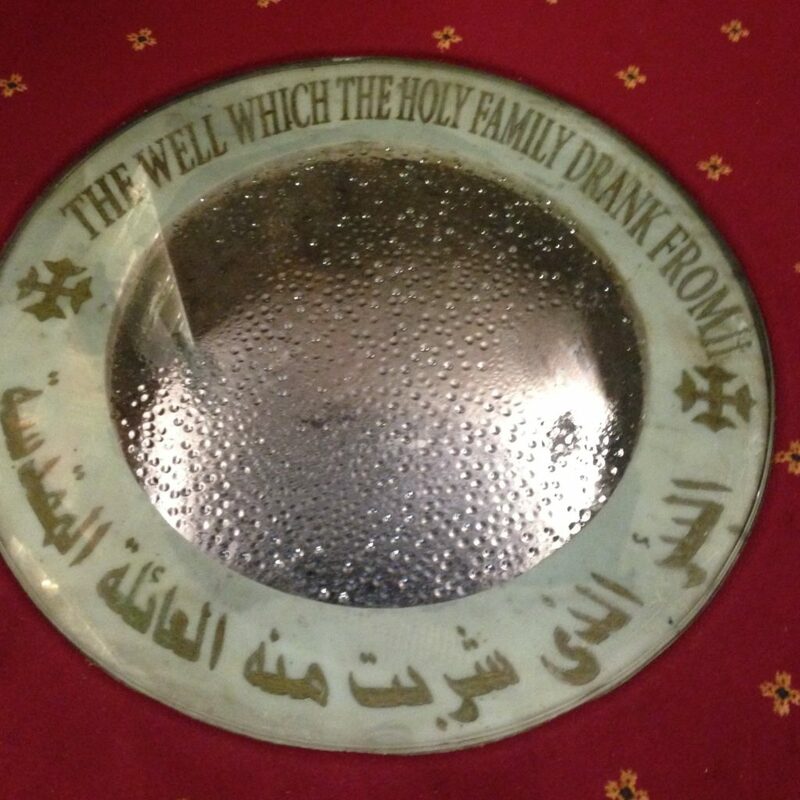 The church has numerous icons of the Flight into Egypt, and in the crypt, one finds a well from which they drank. Actually, Abu Serga is not the only place they stayed. 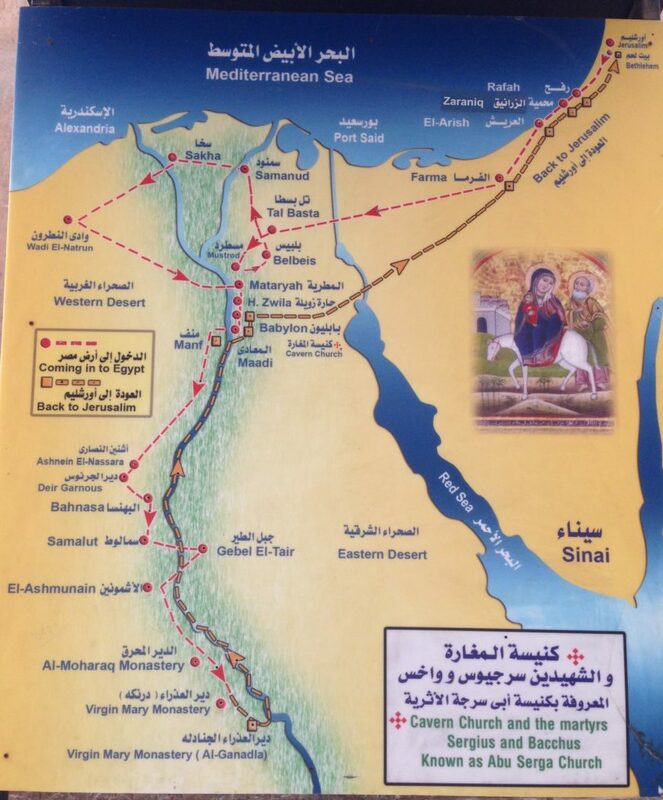 Tradition holds that the Holy Family did a grand tour of Egypt during their sojourn there, bestowing bragging rights on many places. Around the walls of the nave in the average Coptic church, one tends to find banks of icons, sometimes with glass cases beneath them, containing cloth “rolls” which, I was told, hold relics. One can deposit petitions or offerings in the glass case. 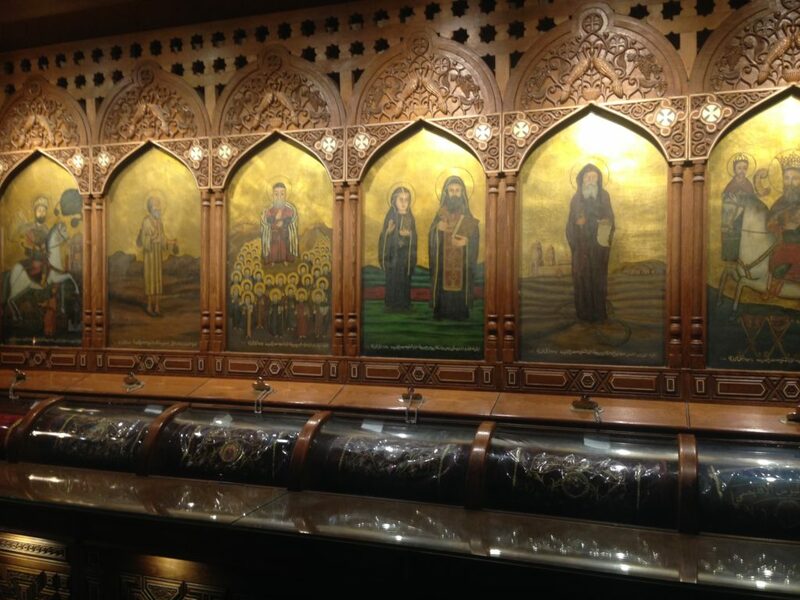 This set of icons can be seen in St. Shenouda’s Church, slightly to the north of the three mentioned above. 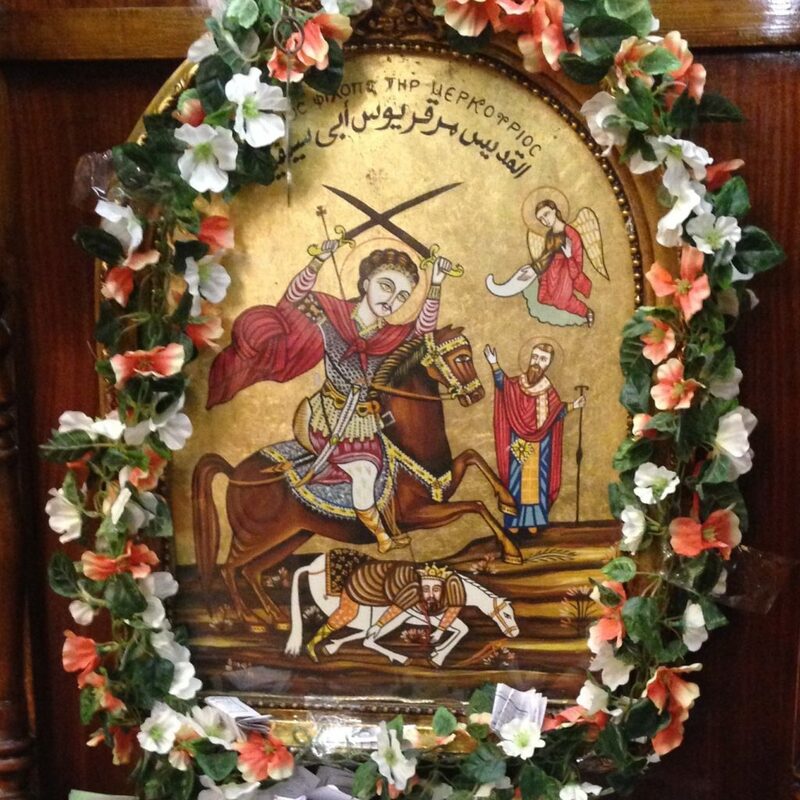 Icons, St. Shenouda Church, Old Cairo. 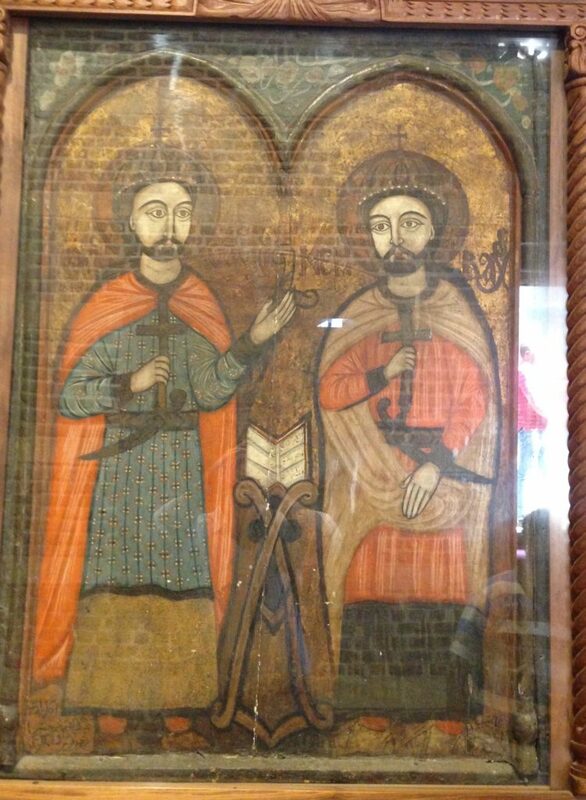 And these two are in the nearby Antique Church of the Holy Virgin Mary, also known as “El Damshiria.” Note all the petitions to the saint on the right. 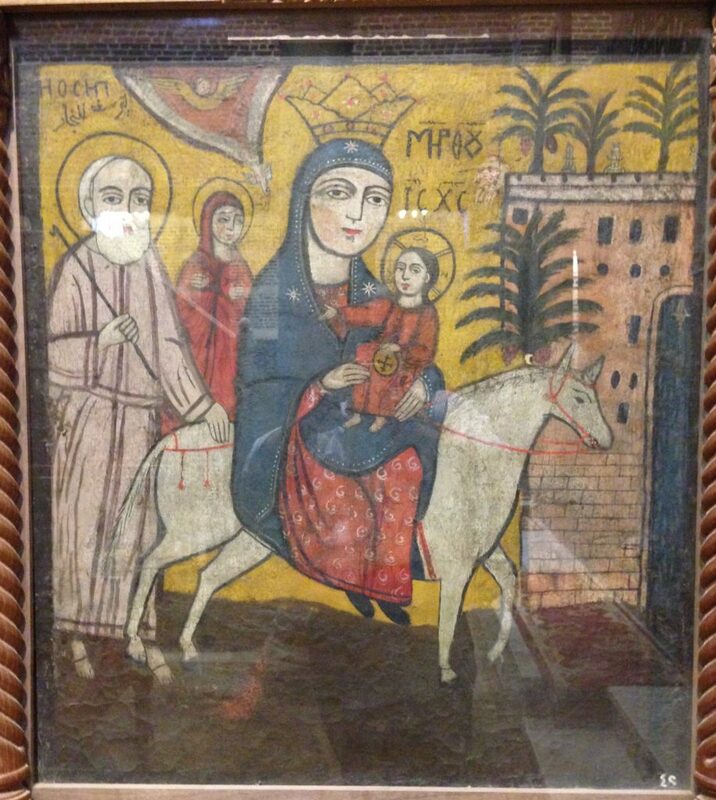 Icons, Church of El Damshiria, Old Cairo. Saint Menas, the fourth-century soldier, ascetic, and martyr, usually shown between the two camels that brought his body back to Egypt from Phrygia. Saints Sergius and Bacchus, a pair of Roman soldiers executed in Syria under Emperor Galerius. 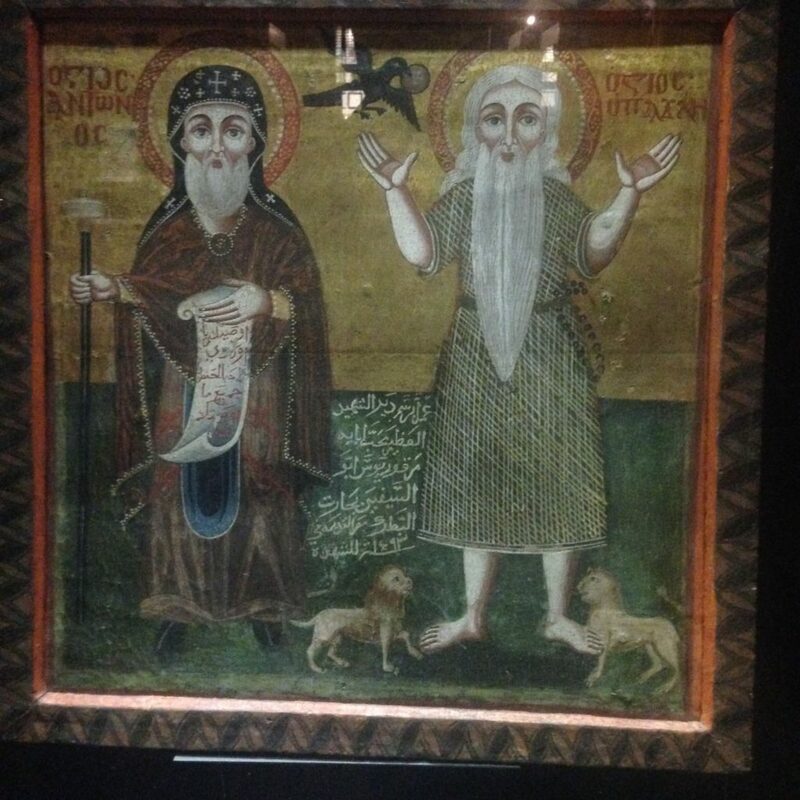 Saint Anthony the Great, founder of Egyptian monasticism, and Saint Paul of Thebes, also known as Saint Paul the First Hermit. Saint Mercurius, a third-century soldier and martyr under Emperor Decius. The image of him riding a horse and brandishing two swords over his head (and spearing a prostate man with a lance) is very common and represents a posthumous miracle. During the reign of the pagan Emperor Julian the Apostate (361-63), Saint Basil prayed before an icon of Saint Mercurius and asked him not to let Julian return from his campaign against the Persians. The image then disappeared, only to reappear later with a bloodied spear. Soon afterwards, news arrived of the death of Julian, killed in battle by an unknown soldier. Saint George. Note the appearance of the miniature pitcher-bearer riding with him. 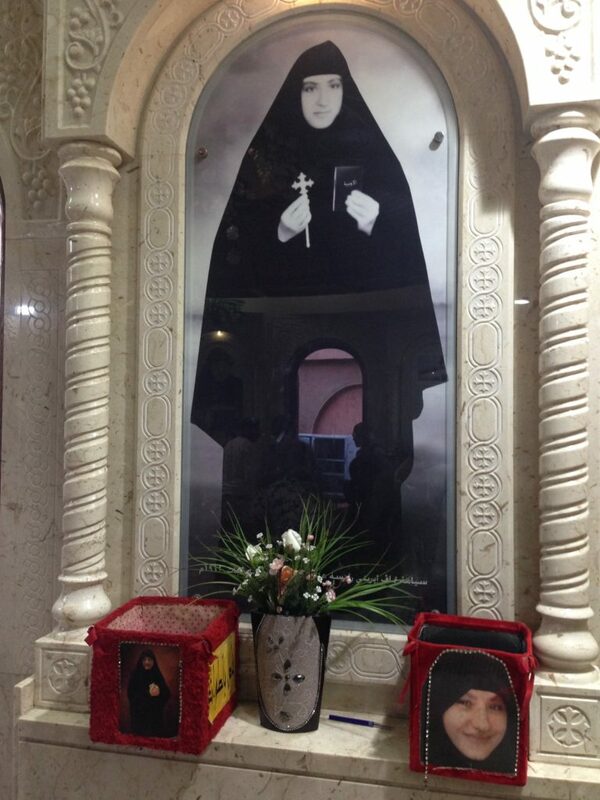 Veneration continues for more recent deaths: the image of Mother Irini (1936-2006), visionary, miracle-worker, and abbess of the Abu Sefein Convent in Old Cairo, was common…. 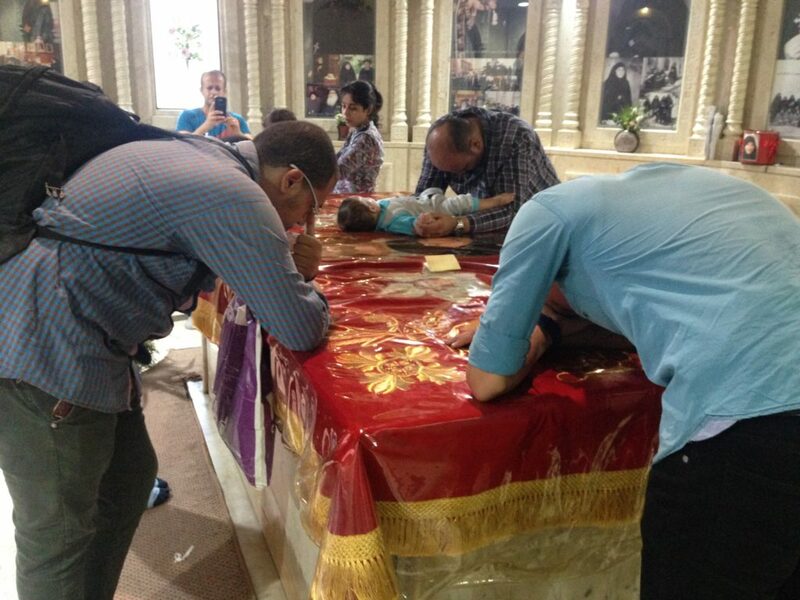 … and votaries pray at her shrine at Abu Sefein. 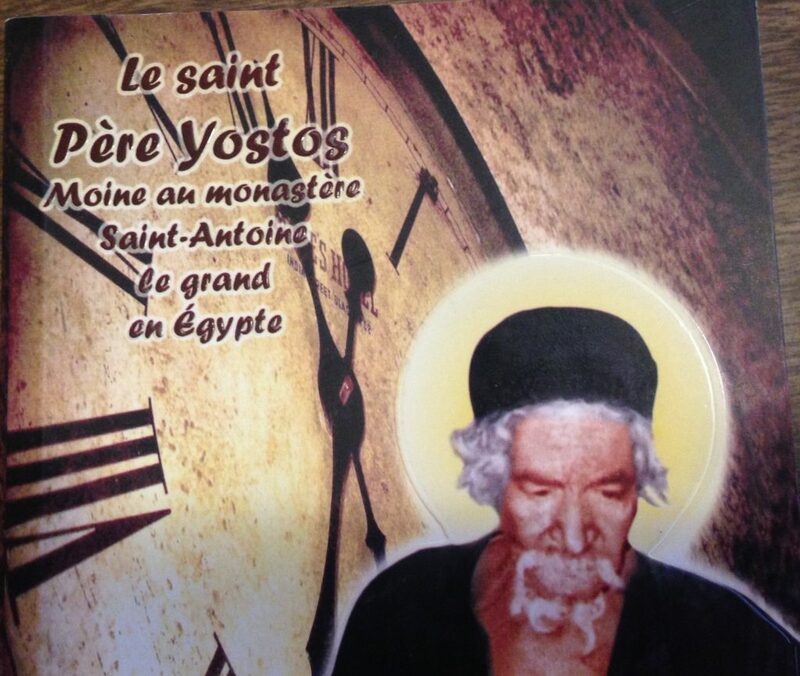 Sister Theophania of St. George’s convent also gave me a little book on the life of Father Yostos (1910-76), a monk at the monastery of St. Anthony and a miracle-worker. In Old Cairo one may also visit the newly-restored Coptic Museum, which houses an extensive collection of artifacts from Coptic history. My thanks to my guide Yasir Magdi for showing me around. 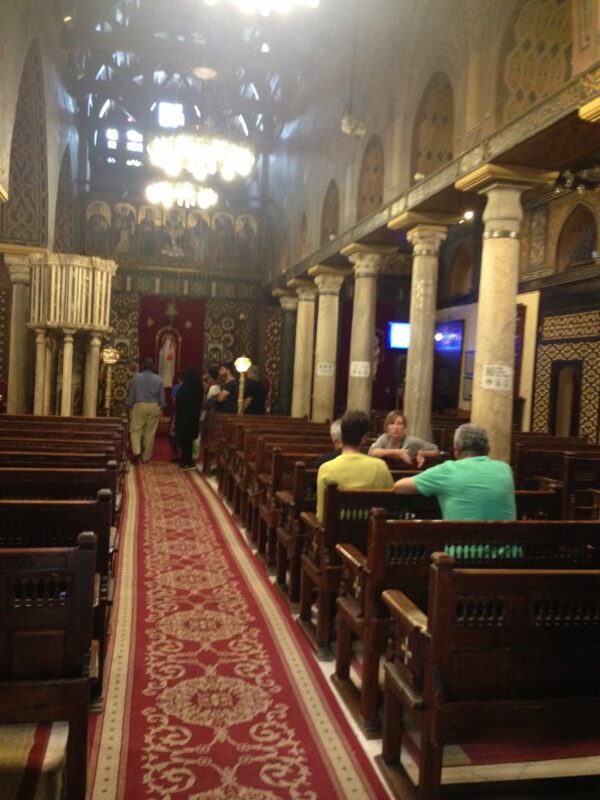 Beyond Old Cairo, one can find Coptic Churches here and there throughout the city. 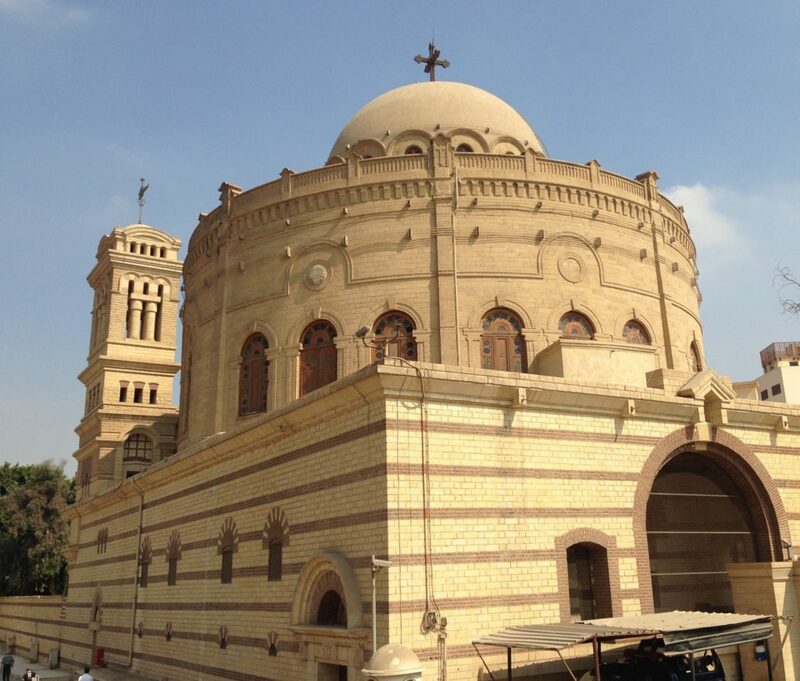 The most important is St. Mark’s Coptic Orthodox Cathedral in the Abbassia District, which took me a while to find. It is also, as you can see, under restoration. 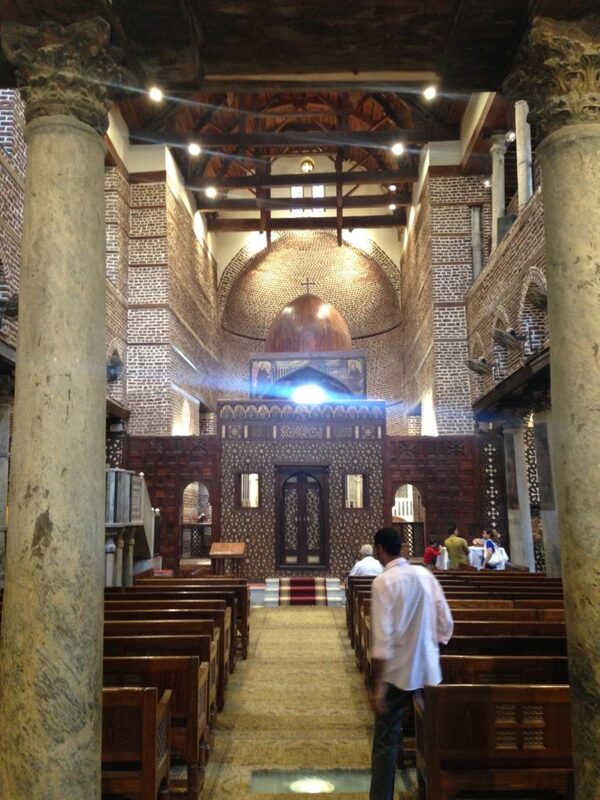 Although the Coptic Orthodox Church is officially the Coptic Orthodox Church of Alexandria, where St. Mark reputedly founded it, the seat of the patriarch has been in Cairo since the eleventh century, and in this church building from 1968. Since 2012, when Shenouda III died, the office has been held by Tawadros II, whose name was selected from a shortlist of three candidates by a blindfolded boy, believed to be guided by the hand of God. 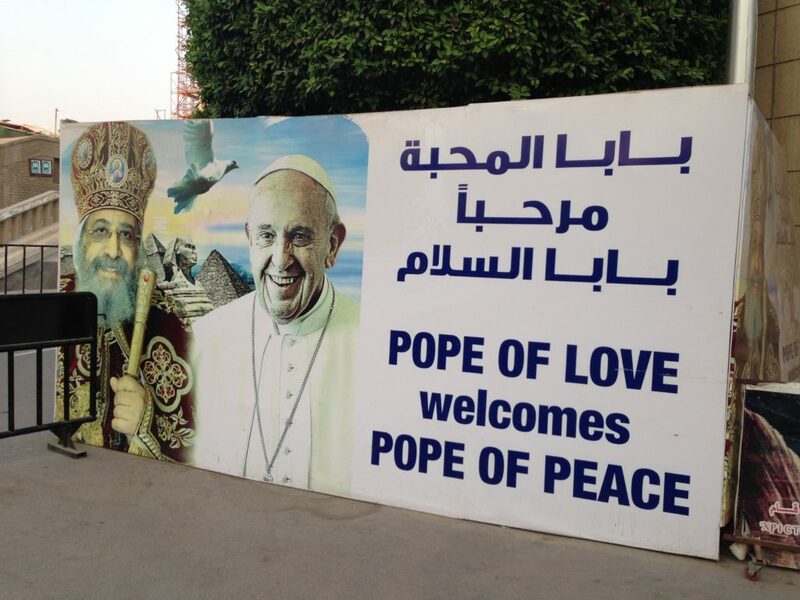 The Coptic patriarch uses the title “Pope,” the only other one besides the Bishop of Rome to do so. The word “Copt” derives ultimately from the Greek word Aigyptios, meaning “Egypt,” and Copts are quite proud of their status as the descendants of the ancient Egyptians. 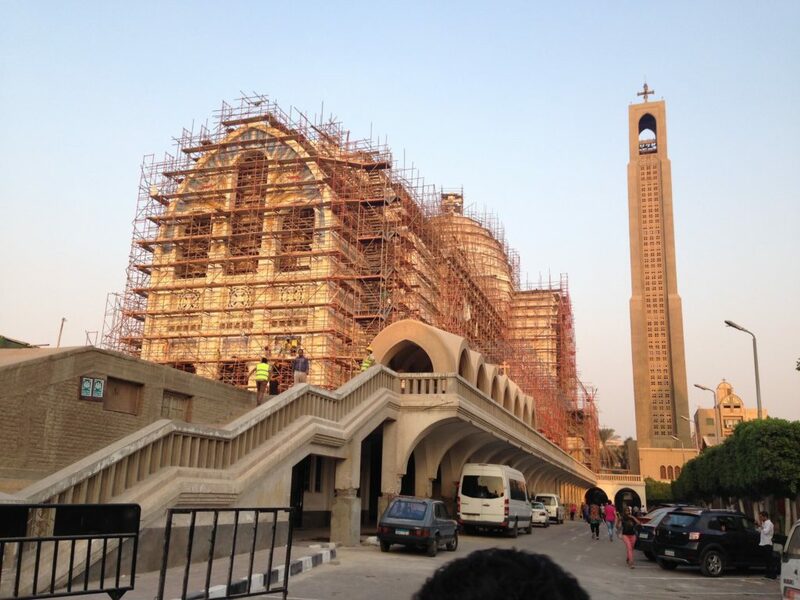 St. Mark’s efforts in Alexandria won a great number of converts who were native Egyptians (i.e. neither Greek nor Jewish, as were most of the original Christians), and the Coptic language is a direct descendant of the Demotic Egyptian of the Roman Era. (You can see examples of its script in some of the photos above – it is essentially the Greek alphabet, with seven extra characters.) 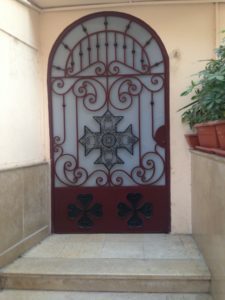 Alas, it is purely a liturgical language nowadays – most Copts speak (and worship in) the same Arabic language as their neighbors. If anything sets them apart, it is a discreet tattoo that many of them will get on their inner wrists, as a memento of their faith. I must record that all the Egyptian Muslims I spoke with insisted that the Copts were their brothers and fellow Egyptians – although the level of security around Coptic churches (a necessary precaution following some recent unfortunate incidents) would suggest that not everyone shares this opinion. * Voltaire: “Assuredly, I understand nothing of this; no one has ever understood any of it, and that is why we have slaughtered one another.” Actually, I think that other concerns usually hang on such abstruse questions. In the case of Chalcedon, I would not be surprised if the much older Patriarchate of Alexandria resented the growing influence of the Patriarchate of Constantinople. Postscript: Prior to this trip, it never occurred to me where Antioch is currently located. It is in Turkey, specifically in Hatay Province, and is known as Antakya. 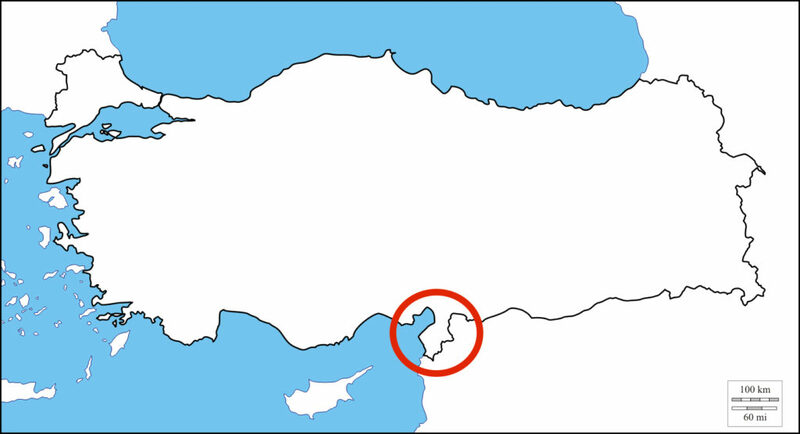 Hatay Province is the little bit of Turkey that sticks down along the eastern Mediterranean coast. Hatay was at one point controversial – and in some ways still is. As a result of the Treaty of Sèvres (1920) the area, designated the “Sanjak of Alexandretta,” was assigned to the French Mandate of Syria. It contained a significant Turkish population, however, which inspired (and probably directed) by Atatürk, started instituting reforms similar to his, and agitating for closer ties to Turkey. Upon the expiration of the French Mandate in 1935, these Turks managed to elect two “independentist” MPs for Alexandretta, who succeeded in getting the French to endorse its independence as the State of Hatay (Atatürk’s name for the place, after the word for “Hittite”). 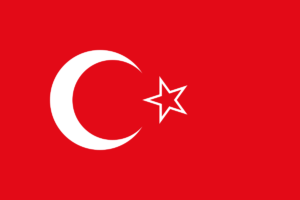 So from September 1938 until June 1939, Hatay was an independent country, with its own flag, looking suspiciously like Turkey’s. A referendum in Hatay approved of Anchluss with Turkey; that Turkey trucked in tens of thousands of its citizens for the vote certainly helped achieve this result. Syria protested, but to no avail – the French were hoping to prevent Turkey from going over to the Germans, as it had in the First World War, and so allowed the merger to go forward. 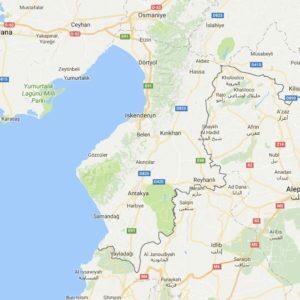 Upon annexation by Turkey many of the Arabs and Armenians of Hatay decamped for Syria, fearful that they would not be welcome in the Turkish ethnostate; certainly the Patriarchates of Antioch, whether Syriac or Greek, are now headquartered in Damascus. 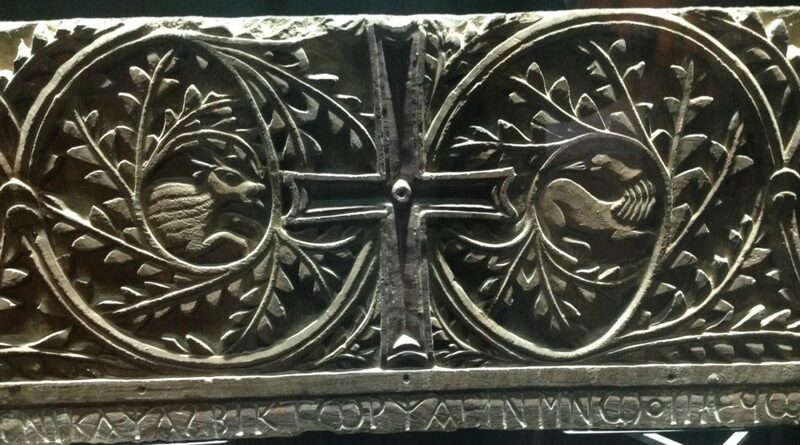 This entry was posted in Christianity, Church History, Egypt by jgood. Bookmark the permalink.